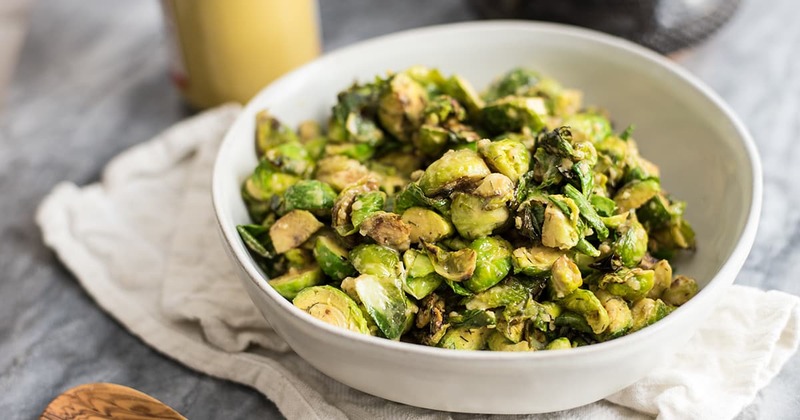 These paleo brussels sprouts with creamy dijon sauce are the perfect weeknight side dish! 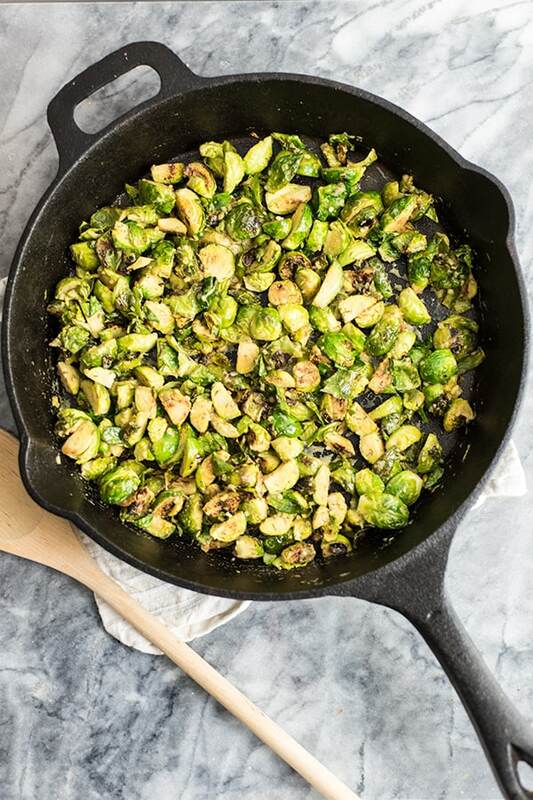 Simple to prepare, these paleo brussels sprouts are whole30 approved, vegan, dairy free and ready in under 15 minutes! I have to admit, when I was the only one in the house eating brussels sprouts, I was rarely adventurous with adding sauces or spices to my brussels sprouts. I would slice them, saute, add salt and garlic powder and devour, usually why they were still steaming hot. I love brussels sprouts, but Dave took some convincing. 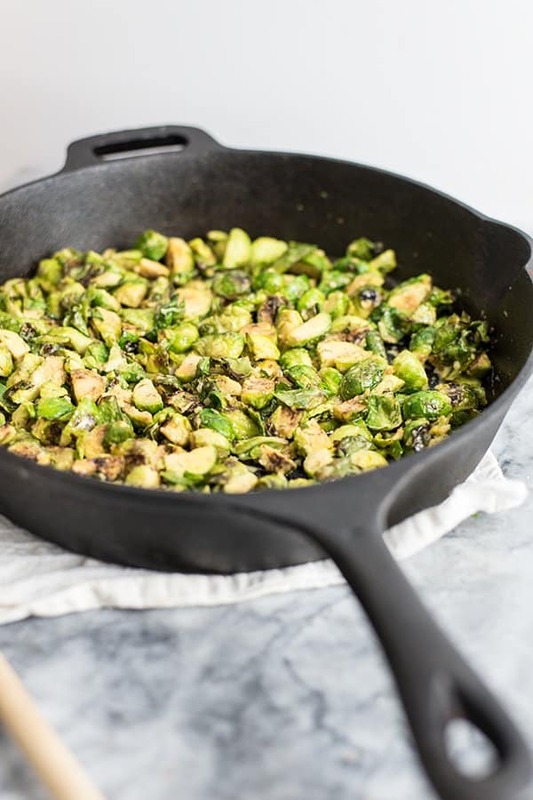 Whether you are like me and love brussels sprouts (and turn your head sideways in confusion when people say they don’t love them), or you are like Dave and swear that brussels spouts are “gross”, I encourage you to try this recipe! I typically meal prep a double batch of salmon cakes, slow cooker shredded chicken, jasmine rice, and have a few bags of cauliflower rice in the freezer each Sunday afternoon. This way I know we have protein and some quick carbs ready to eat in the fridge. These are staples in our house, and when it’s time for dinner, I usually just have to make a side dish and heat everything else up. 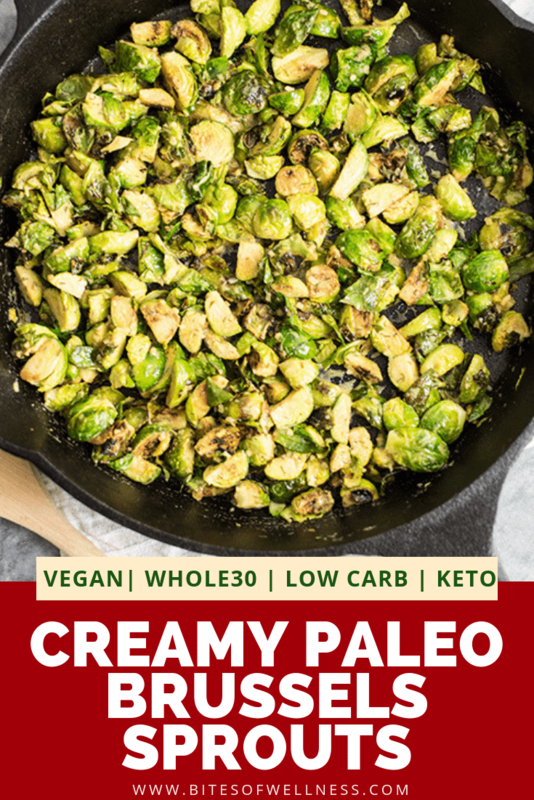 Lately, these paleo brussels sprouts with creamy dijon sauce are what Dave requests as our vegetable. I think it’s the sauce, which is a bit tangy and the vinegar helps cut through the cabbage flavor of brussels sprouts. I read somewhere that cutting up brussels sprouts can help alleviate any gas or discomfort you might usually associate with eating brussels sprouts. Also don’t steam brussels sprouts, that’s just nasty. 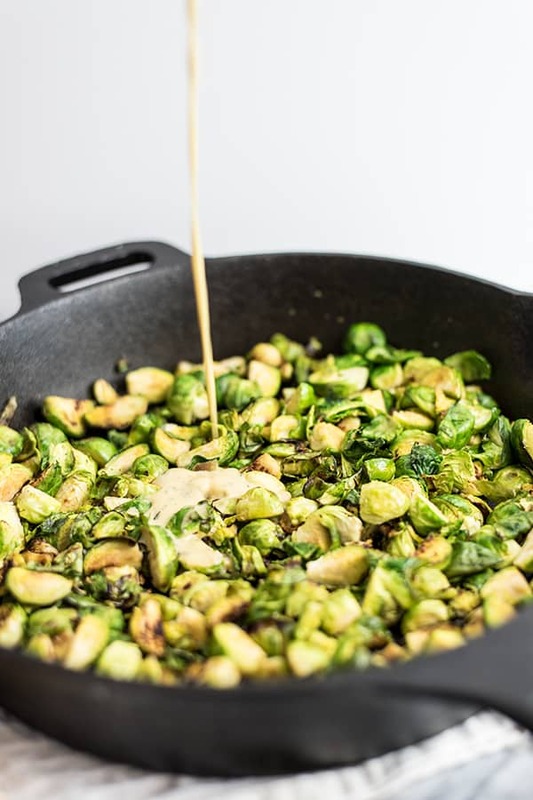 The key to making these paleo brussels sprouts irresistible lies in letting them get caramelized in the pan before adding the sauce. I like to preheat my cast iron skillet while I’m cutting up the brussels sprouts. Once the pan is hot, I add avocado oil (or coconut oil) and the brussels. Let them cook for at least 5 minutes without touching them. After that stir them well and cook an additional 5-6 minutes, stirring occasionally. While the brussles are cooking, make the sauce. This way everything is done in under 15 minutes. 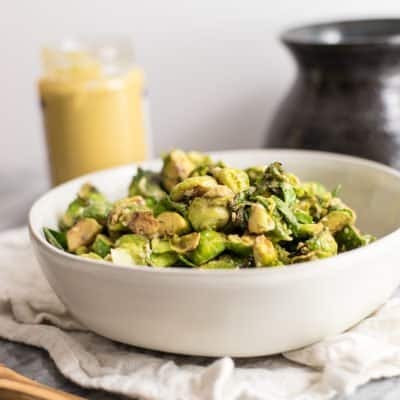 If you love brussels and can’t get enough, you have to try this whole30 spicy sriracha brussels sprouts recipe, this shaved brussels sprouts salad with creamy balsamic dressing, or this quick apple brussels sprouts hash (perfect for breakfast). 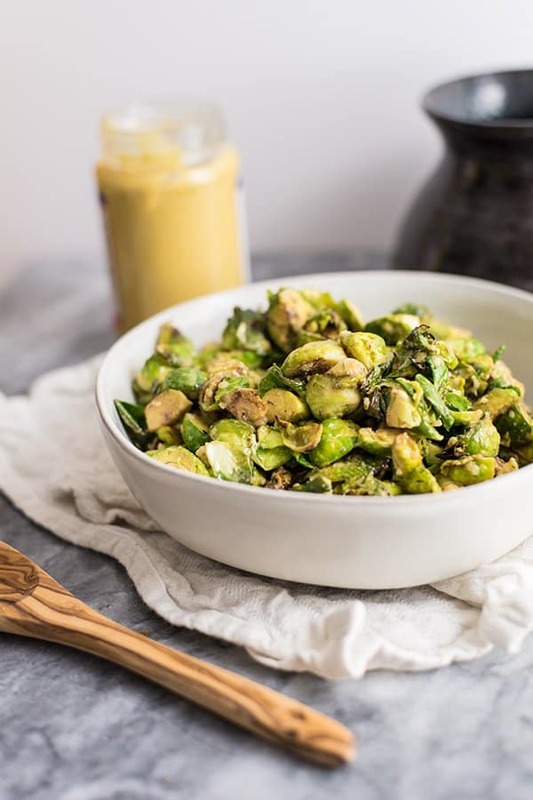 This paleo brussels sprouts with creamy dijon sauce is the perfect weeknight side dish! 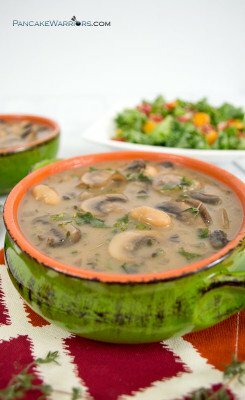 Whole30, vegan, dairy free, grain free and super simple to prepare! 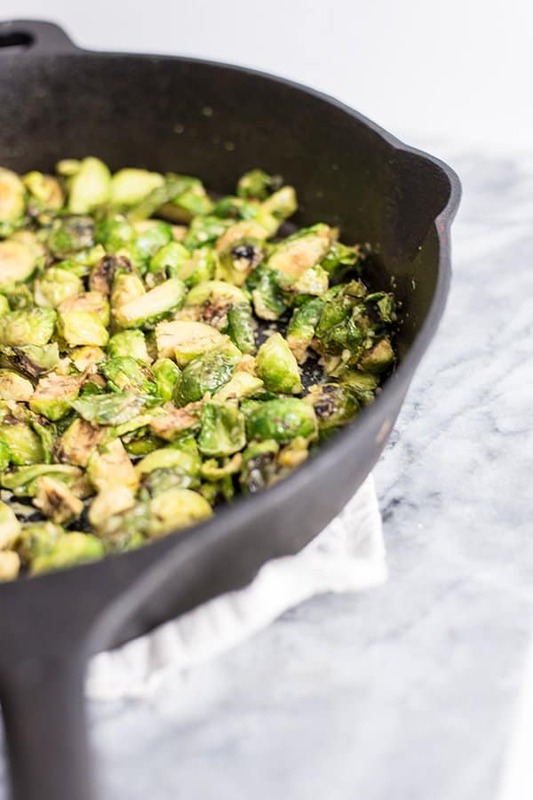 Preheat the cast iron skillet while you are quartering the brussels. If you are not using a cast iron skillet, preheat your pan (just don't let it get too hot). Add 1 tbsp of avocado oil to the preheated pan. Add the brussels immediately, making sure you distribute them around the pan. Sprinkle with 1/2 tsp. salt and let sit 5 minutes to caramelize. Stir well and cook an additional 5-6 minutes. While the brussels are cooking, make the sauce by combing the dijon mustard, 1/2 tsp of salt, 1 tbsp. avocado oil, the apple cider vinegar, water, garlic powder and dried dill. Stir well. Once the brussels are done, add the sauce, stir well and serve hot! Do you meal prep? If so what do you make? 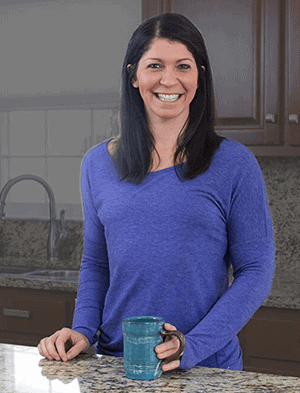 Do you have a cast iron pan? Your Brussels Sprouts look delicious, the sauce will be great! Thanks so much for sharing your post with us at Full Plate Thursday. Have a great week and come back soon! I love, love, love brussel sprouts! I have two recipes for different flavors. I love to find new recipes to change up the taste of brussel sprouts. I pinned this recipe to my Pinterest! I love Brussel sprouts. I have never tried them with the ingredients in this recipe. I am interested to see how they taste in this recipe. 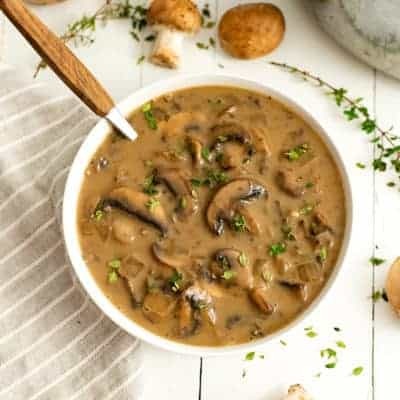 I love that this recipe is whole30 approved and dairy free. Thank you for sharing! I love brussels sprouts, but we don’t usually make them with mustard. Such a great idea!